HOLLYWOOD — Super frisky and ferociously adorable, three female baby river otters are training in Hollywood for the spotlight in Big Cypress. 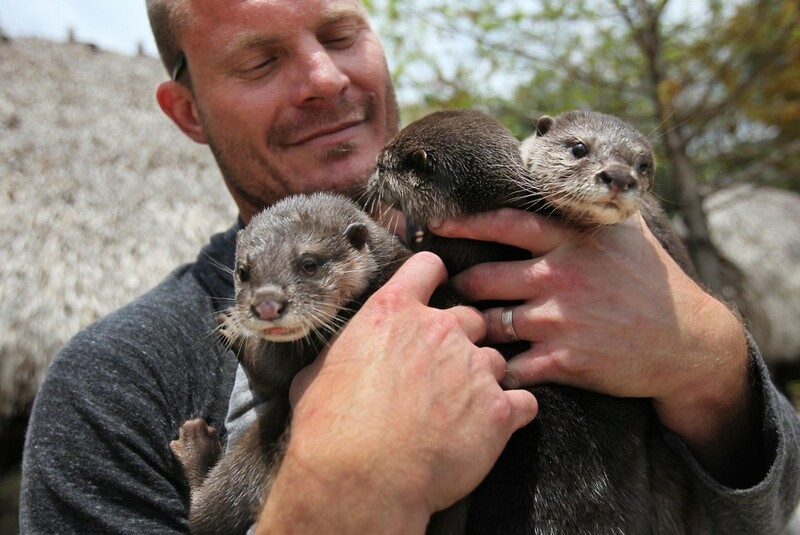 “They are cute, cuddly and obviously very mouth-oriented now,” said “Otter” John Jones, Okalee Village wildlife manager and certified animal handler, while being smothered in otter kisses by all three at once. The 5-month-old sister trio, to be named later, is being schooled to be a cool addition to a menagerie of snakes, hawks, turtles, panthers, alligators and other native beasts and birds at Big Cypress Reservation’s 2,200-acre Billie Swamp Safari. But don’t be fooled by baby otter faces with tickly whiskers. As the otters mature, their teeth will become sharp as shards and their jaws will be so strong that they could rip the skin off an alligator, Jones said. In about a month, fenced safely within 3,600 square feet of freedom complete with a watery 10,000-gallon pool, the gymnastic antics of the squiggly swimmers will surely draw crowds. That’s what they get paid for – in beef, fish and occasional carrots. “When people visit Billie Swamp Safari they want to see what they see at Disney World – happy critters and smiling faces. And we want them to come back and bring more people,” said Wovoka Tommie, acting director of operations at the rustic attraction. Born in Louisiana, the otters were brought to Okalee Village at just 3 weeks old by Jones, a six-year veteran of the Hollywood animal show venue. There, and at his Miami home, Jones bottle-fed and burped the pups every three hours. Now housebroken, the otters were coaxed to relieve themselves at appropriate, scheduled times. In the wild, mother river otters begin teaching babies to swim at about 3 weeks old. Jones had to wait 45 days before introducing them to water via a blue plastic kiddie pool. He coddled them to gain trust and helped them to sleep on warm heating pads. “It was just like having new babies in the house,” said Jones, also a falconer who is training a hawk and other birds of prey. The new otter habitat, designed by Jones, features plenty of creature comforts. The pool is elongated and narrow with slight turns to simulate the motion of a river flow. In the center is a native tree and plant island. Because otters seek shelter for sleeping day or night in the burrows of other animals, a small structure called a night house is under construction a few feet away. Big Cypress Councilman Mondo Tiger said the addition of the otters at Billie Swamp is part of a larger renovation and expansion underway at the tourist attraction. The alligator pit has been restructured to include more sunning space, a trickling waterfall and a triad of chickee stadium seating areas. Pathways are embossed artistically with creature footprints and fossil effects. Several new chickees have been added for an authentic Seminole camp that includes sleeping and cooking chickees. Gift shop items that are mass produced overseas will be sold until gone, but not inventoried. The shelves will be refilled instead with authentic items manufactured by Indian-owned companies and Native artists. “We already have our own basket maker, beader and doll maker ready to move in, work and sell,” Councilman Tiger said. He hopes to add a zip line ride by summer and a chickee-inspired hotel and meeting center in the next few years. Jones said the new digs may be finished by mid-May. Separating from the pups may be difficult – for him anyway. “Let’s just say that I will miss them more than they will miss me,” he said.